My name is Kevin Johnstone, aged 38 from Carlisle UK. This is the story of my great-grandfather John Farrer of the 11th (service) Battalion, Border Regt. who was killed in action on July 1st 1916, near Thiepval, in the 1st Battle of the Somme, as far as I have been able to research. 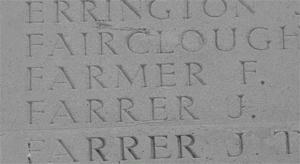 John Farrer-born 1st October 1882 in Gaitsgill, Cumberland.Son of Frances Farrer, domestic servant. On his birth certificate only his mother is mentioned, although she cannot write and has made her mark Her father appears on his marriage certificate, though. John was married in 1906 to Mary Byers, on by coincidence a domestic servant herself, on Christmas Day (I presume time off was not readily available to them.) John was a coal miner by trade, who joined the Lonsdale Battalion in late 1914, as one of the "pals battalion'"volunteers. Colonel Percy Wilfred Machell took over command of Battalion Headquarters, at Carlisle Racecourse (Blackwell) on Sept 25 1914. He was to become the heart of the Battalion and the men came to revere him. He turned the varied farm servants, miners, clerks etc into soldiers, initially on his own, as he did not even have an Adjutant until December - Capt P.G.W.Diggle was appointed. Pte J. Farrer was one of these early recruits, who were formed into the original companies. A and B Companies were formed from North Cumberland, 75 men under Major Binning and Capt. Sale Private John Farrer 19455 was one of these 75. At Workington D company formed from West Cumberland men and Westmorland men formed C company. They moved to Blackwell for training on 15 Oct, 642 strong, and recruiting continued as training began. By 8th May 1915,they were a real 'Pals' battalion in every sense and moved to Brigade camp(124 Brigade) in Prees Heath, Shropshire. The people of Carlisle had given them a tremendous send off, with bands and cheering crowds all the way down the rail lines to Oxenholme. Prees Heath was found unsuitable for training so on 22 June they moved to Wensleydale as part of 32nd division. There, under canvas, they did Musketry and other training as part of their preparations for war. The Lonsdales and 3 Battalions of the Highland Light Infantry became 97th Brigade, under Colonel Jardine, of the 5th Lancers. In August, the commanding officers left for a visit to the trenches of the western front, and the men were to distinguish themselves in training at Salisbury Plain. After some home leave, on 23rd November 1915 the battalion and the rest of 97 Brigade left for France, sailing from Folkestone-Boulogne on 'the Princess Victoria'. On arrival they made for Albert, and served their apprenticeship in trench warfare, like all the other Pals Battalions, with some cost, and at some discomfort. They took part in all aspects of trench life - raids, time in supports, fatigues, reserves and rest billets, and men were lost as the steep learning curve of trench warfare was absorbed. One such raid was undertaken, on the night of the 5/6th June by the Lonsdales, on the area they were due to attack in the Big Push, Authuille Quarry on the Liepzig Salient, known as The Granatloch. This raid was launched to provide intelligence of the state of German defences in the area. The raid was led by Lieutenant William Barnes, with 4 officers, 25 NCOs, and 55 men, from a communication trench opposite the Granatloch at 11pm under cover of a bombardment. Bangalore torpedoes were used to clear the German wire and the German trenches were entered at 11.17pm under a retaliatory German bombardment. A quite comprehensive picture of the defences, dugouts and positions of the enemy was obtained, including details of the depth and construction of said dugouts (this should have forewarned the British of the ability of the enemy to withstand their planned bombardment, but unfortunately, this was not the case). Prisoners were taken, some of whom proved so troublesome, that their captors had to dispose of them on the way back to prevent their escape. This was due to a German barrage making things very difficult for the raiding party, Lieutenant Barnes and 3 men were killed returning. The raid was able to furnish in-depth information on the point of attack of the 1st July, with diagrams of the opposing trenches and dugout positions and also some detailed sketches of the dugouts themselves, including layouts, construction and depth. On 24th June 1916,as part of Xth corps, 32nd Div, 97th brigade, the Lonsdales moved to take over the Authuille sector from the Manchester Regiment in preparation for the Big Push. On this day the Bombardment started - it was to continue until July 1st,when the assembled men of the Somme Offensive were to go Over The Top. History tells us the bombardment did not have the effect expected and the brave men of the British Army, with many pals battalions among them, walked right into murderous machine-gun fire from dazed but still effective German defenders, in well prepared ,well wired, trenches. At zero hour, the 16th and 17th Highland Light Infantry led the assault on the Leipzig Salient and took the tip of it before the Germans had time to leave their dugouts. They were unable to progress beyond this, due to the volume of fire from the second line, the Hindenburg Stellung,and the Wundt (wonder)Werk Strongpoint, whose wire was uncut and whose machine guns had time to go into action. They were able, though, to hold and secure the Granatloch (this proved to be the northmost bite into the German lines that day!). At 08.30, the Lonsdales left their positions in Authuille Wood as reserve for the 97 Brigade, they were supposing that the Leipzig salient was by now in British control. They left the wood and the plan was to advance up the communication trenches alongside the track from the wood to the quarry, to the front line. These trenches were Chequerbent Street to the east and Kersall/Chowbent Street to the west. On the day these trenches were full of wounded from the initial assault, and were registered by German Artillery. The Lonsdales left Birtle Post on the wood's edge and crossed open country, still about 500 yards behind the British front line. They came under enfilade fire almost immediately and their dead and wounded were strewn across the open ground, before they even reached the front line. The German strongpoint of the Nordwerk had enfilade fire over this area, as the attack on these positions by the 8th division had not made any impact. This, combined with the decision to only lightly engage the southern facing edge of the Leipzig Salient - for fear of catching the more northerly attacking troops in friendly crossfire - meant the Lonsdales walked into the teeth of some very heavy fire as soon as cover was left. It was now Colonel Machell decided to go forward and lead those of his men that had made the front line, over the top. He was killed almost immediately, as were most of the Lonsdales that were left, in No-Mans Land. Some of them however, made it across to the Granatloch where they held it with a mixture of remnant soldiers from all the attacking battalions. These men even tried to advance over the top, and bomb their way towards the Wundt Werk and the maze of trenches that included the Bull's Eye, but found the volume of fire too much and were forced to defend the 'bite' they had as several counter attacks were launched from the Hindenburg Stellung and the Bulls Eye. This they did. Part of me would like to think, as my great grandfathers body was one of the Missing of the Somme, that he was one of those men who made it to the Granatloch and took some part in that brave defence against the odds. Maybe it would explain why his body was never identified, those still behind the front line would surely have been buried quicker and have more chance of identification (it feels better than being blown to pieces by a shell.) who knows? But I like to think of the first scenario rather than any other. 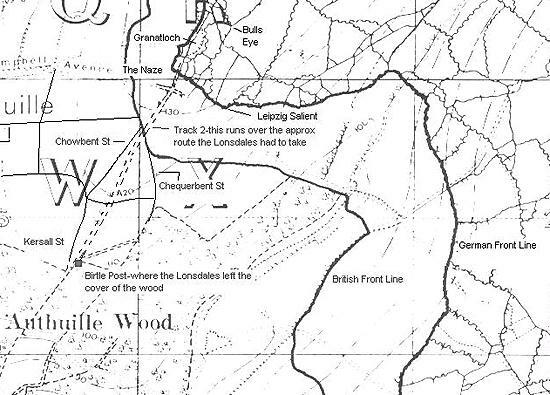 Map of the Authuille Wood area showing the main points of interest of the Lonsdales story. 'Zero hour on July 1st 1916 was 07.30 and the Lonsdales were to follow the Highland light Infantry battalion who went over first half an hour later. They were to march out of trenches in Authuille Wood and link up with the tail end of the Highland Battalion, then execute a 90 degree turn to face the Leipzig Salient. This maneuver left them open to enfilade fire at all times if, as was the case, any German soldiers survived the bombardment. At 08.30 Col. Machell, gave the order to move out and the Lonsdales shook hands and, cheering and singing, went over the top to meet their date with destiny. As soon as they got into open ground beyond the wood deadly enfilade fire ripped their ranks to shreds, strewing the brave Lonsdales all over the open ground. Of the 800 men and 28 officers who advanced out of Authuille Wood that day, 500 men and 23 officers failed to attend roll call the next day, either killed or wounded. 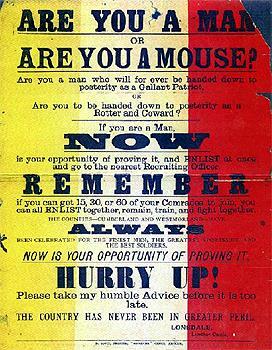 Official battalion records show-'MEN COULD DO NO MORE'. Private John Farrer was among those that never returned from that ill fated attack and his body was one of those unidentified or lost on the battlefield. He was my Great-grandfather, my grandmother Norah, his youngest daughter, was born a year earlier 28/6/1915 (conceived during his training period).They and many other families knew the sorrow of the full Somme Pals Battalion impact upon a community. 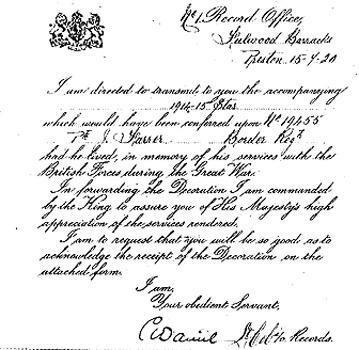 His wife, mind you, still was given an award by the King for home service to others later in WW2 (the honesty and patriotism of people of the time still amaze me). my great grandmother received after John's death. It was not until my Grandmother passed away in 1998, that, as oldest surviving relative I found among her papers information which set my interest in finding out about the First World War. With some help from another relative of hers, who found various documents, I have taken my research, via the local library to the stage it is now. Also it has engendered a keen interest that has flourished ever since, in the Western Front. This is and will be part of a file of family history I intend to pass on to my children one day - so no-one will forget.